Discussion in 'Safety' started by Hughesie, Mar 21, 2009. The Stage Manager is the one under the ladder, of course i did say something but i was shouted down for being "too safe"
and of course the stage manager was painting while the two above on the ladder were building the set...with a drill and a hammer. See Flag Rules and Regulations, specifically, item#8. The above photo shows the US flag being displayed incorrectly. I believe this act carries the death penalty in Texas. That looks like a two sided ladder, designed to be climbed from either side. Two people climbing on it may or may not be considered a safety violation. As long as they're not working with electricity and the ladder is in good condition, metal is fine. Given that two people are working above your stage manager, I'll grant you this one. That said, if there were nobody working above her there would be no problem. Then I'm glad I don't live in Australia. 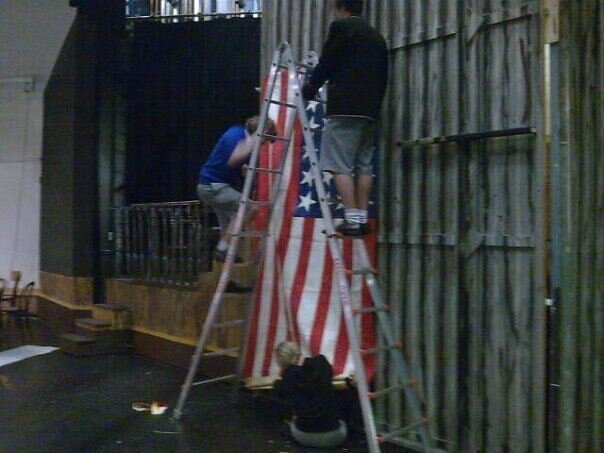 That ladder is not even close to the largest ladder I've worked with in a theatre. My current venue has one larger A-Frame ladder, and one much larger extension ladder, both of which would be impossible to do certain jobs without do to access issues. DavidDaMonkey and (deleted member) like this. Ladder to large for theater use??? Please explain. I have an A frame ladder much bigger then that. I use the genie for most focusing but there are times where is is alot easer to get an A frame in between the set and focus that way. That Little Giant Type 1A Classic is rated for 300lbs, but has been tested to 4 times that. I don't see a huge problem. Maybe not the best idea ever, but not likely to get anyone hurt or killed. The invasion force is on its way. Offending parties will be executed post haste. Little giant ladders are built like tanks. Now, a 15' tall A-Frame with a 10' center stick.. now that is an unsafe ladder. Now, a 15' tall A-Frame with a 10' center stick.. now that is an unsafe ladder. But oh, so much fun to use. It's been more than a decade since I was last on one of those. Hey.. we just got rid of our old wood one a few months ago. It made a great fire. Now we have a fiberglass one that's just a bit smaller. It may be rated for that and tested for greater, but that doesn't qualify for safe practices. I'm not sure how it's handled down under, but here in the US, that would be a definite OSHA no-no. Yes, I understand that students don't necessarily fall under the auspices of OSHA, but that doesn't mean that the regulations shouldn't be observed. If anyone had been injured due to disregard of the manufacturers limitations (which I believe states one person on the ladder at a time), I bet the insurance would not pay for damages. I think that you were well within your right to point out that they were working in an unsafe manner. Since they weren't working near electricity, the metal ladder is fine, but you didn't call them out on that, just mentioned to us. You say that the ladder is too large, what are the regulations down there? You are forgetting the other ramifications of the actions. Somebody walking under a ladder is several years bad luck, the only thing you can to now is fire the stage manager under the ladder for dooming the show. It's probably a replica flag from when the USA only had around 24 states, the play they are doing prolly takes place in the 1800's, between 1822 and 1836 when the US only had 24 States. Those ladders are designed for 2 people. Little Giant Ladder As for being metal, true, but non-conductive IIRC. I could be wrong. Yeah, working under a ladder is stupid. As for being too large, possibly. I'm not a theater person. I'd like someone to name a metal that is non-conductive...I sure haven't found one. It may have rubber feet that isolate it from ground....but that doesn't make it non-conductive.